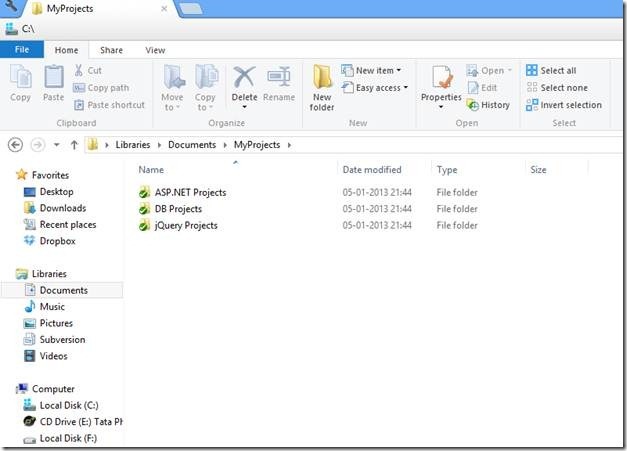 Let cloud storage take care of automatically backing up your source control repository. 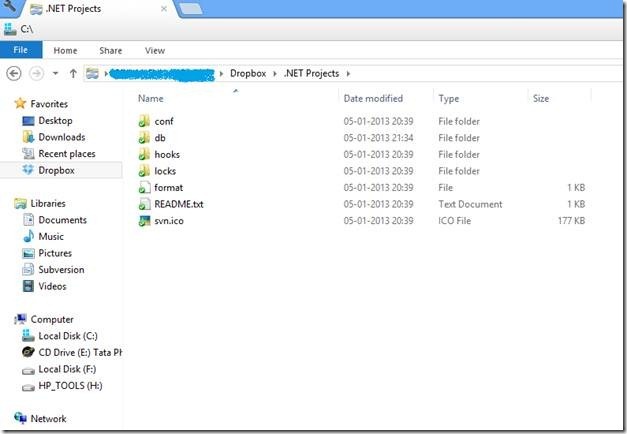 In organizations of every size, code is generally managed with the help of source control. It is great for keeping a versioned history and doing branched modifications. The code repository is generally kept in a regularly backed up environment, having someone caring for it with all their wit and skills. But the same level of service and peace of mind is not available to the same set of developers working on their weekend projects on their personal computers. Granted they can have the source control, but having a service regularly taking back-up of your repository can be hard; sometimes because of lack of time and/or storage media and at other times because backup is fragmented at different places and we do not have any idea of the whereabouts of the latest one. 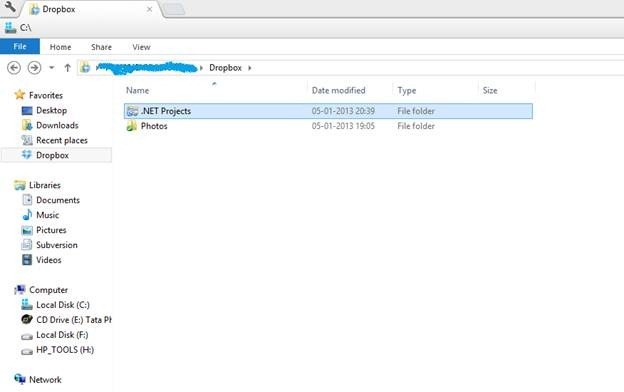 Cloud storage removes this obstacle and allows us to take care of automatic backups, in fact, instantaneous backups of the repository, whenever anything in repository is revised or added, without the hassle of handling any storage media. This has been made possible fundamentally by the fact that most of the cloud storage services provide a client application that can watch over a certain folder for any changed and/or new bits of information. 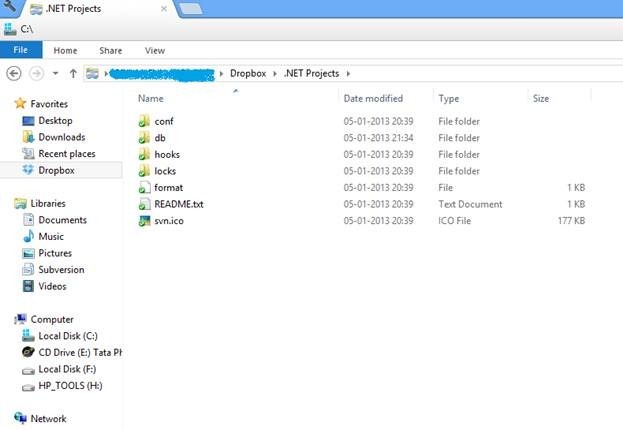 Here I will be covering on how to make DropBox’s Windows client application take care of a Tortoise SVN repository. 1. 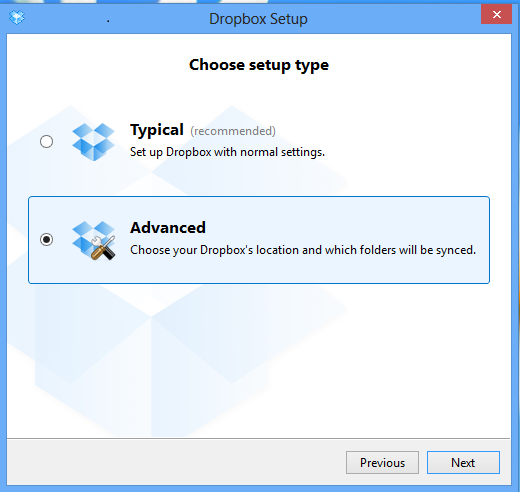 Install DropBox’s client application, appropriate for your operating system, with advanced parameters, specifying the name and location of the DropBox folder and choosing selective sync. 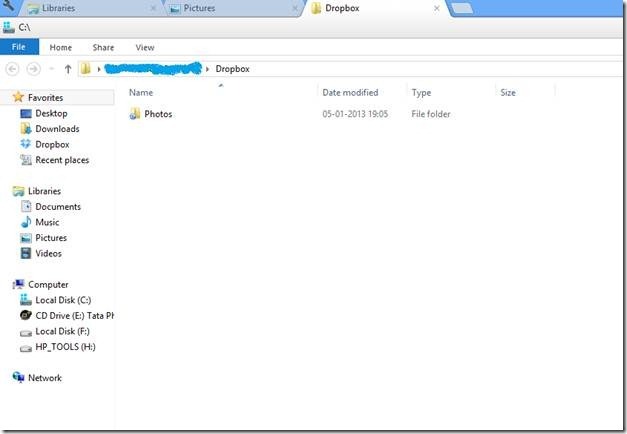 If you have multiple accounts, make sure you provide the credentials of the account where you want a copy of the repository to be stored. 2. 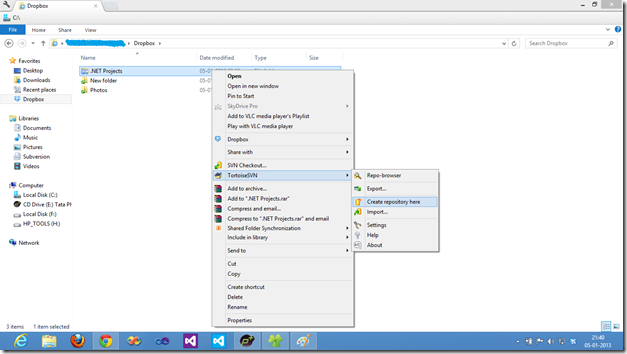 Install Tortoise SVN with default parameters. 3. 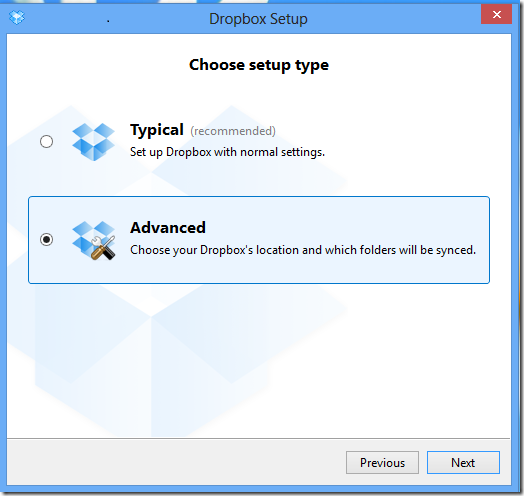 Go to the folder that is being watched by the DropBox client service for any updates or additions and make a new folder in which you want the repository structure housed. 4. 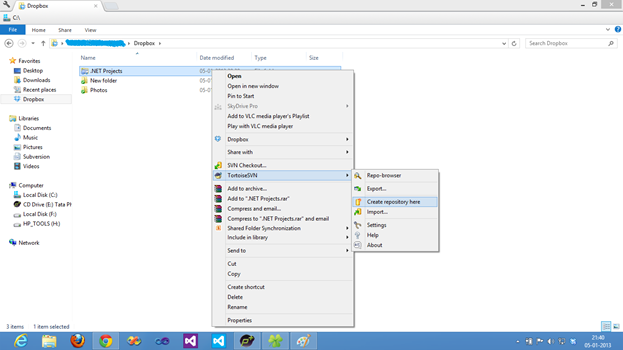 Right click on the folder and create a new repository there. 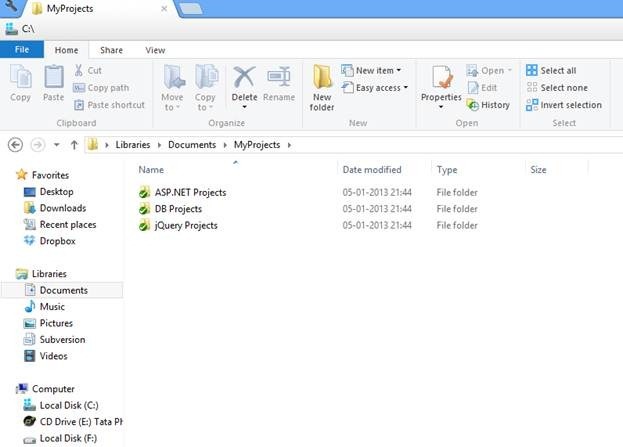 Tortoise SVN will create a new repository there (there will be folders like conf, db etc.). 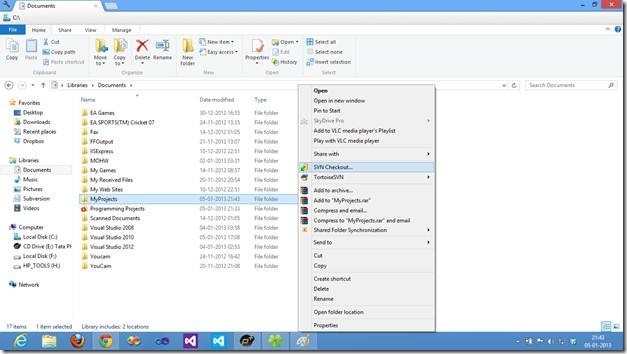 You will be storing your code in this repository. 5. 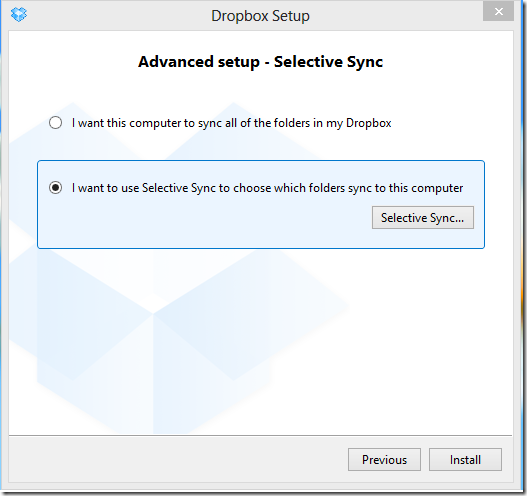 Once you create a new repository, DropBox application will immediately start synchronizing the backup folder with the one on its servers, replicating the entire repository structure. 6. 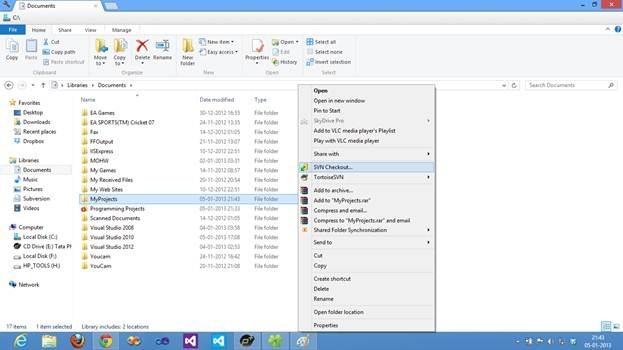 Now navigate to the location to where you want to have your working copy of code. You have to create a working copy in which you will later be checking in your code and any new assets that you want added to your repository. 8. 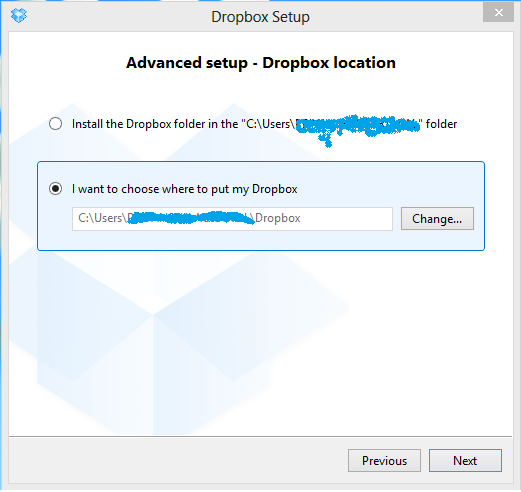 Once you do any updates to your repository from your working copy, only the bits that change or gets added will be uploaded to your DropBox profile. 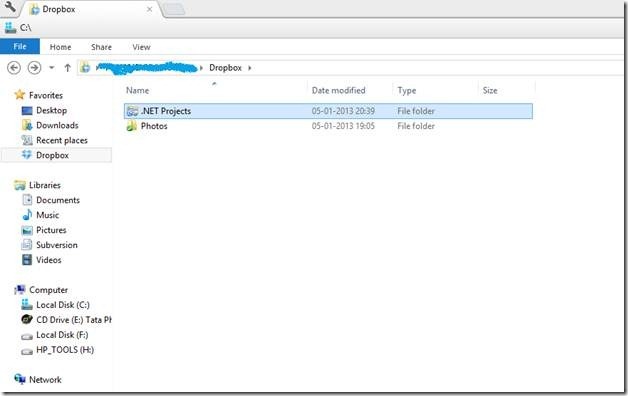 It is important to understand that you have to make a backup of the repository structure itself (i.e. the weird structure containing folders such as conf, db, hooks etc.) and not the working copy, since you can always get the working copy from the repository. Many thanks to my brother Priyanshu Agrawal for letting me use his computer for software installation and resultant screenshots. The traditional approach to inheritance has been to define a superclass and a sub class approach. An example of that would be that of Car being a general class embodying all the common attributes and behavior of a car, and a specific car segment such as sedan, sports car, wagon etc. being a subclass inheriting from the Car class. But in real world relationships among entities are much more complicated than that. As object oriented paradigm matured, object oriented languages also advanced and gave us a lot more fundamental structures that supported abstraction and realization of relationships that did not fit well into the classical inheritance model. A complementary concept that goes hand in hand with the relationships is the concept of multiplicity, explained later in this post. 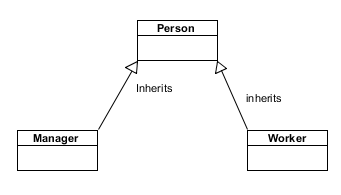 A generalization relationship is a parent class relationship, embodying the classical OOP concept of traditional inheritance. The relationship emphasizes a “is-a” relationship, and the shown with the help of a solid line with a hollow arrow going from the from the derived class and pointing to the parent class. Example: A manager and a worker both are person on a higher abstract level, hence both Manager and Worker classes can be thought to derive from the Employee class. As the name suggests, dependency relationship suggests a dependency of an entity over another. Dependency relationship is also called a client-supplier relationship, in which the client depends upon the supplier for accomplishing something. One important defining characteristic of this kind of relationship is that if the supplier changes in a way, then it affects client in some way. In UML, dependency relationship is shown by a dashed line with an arrow on one end, going from client and pointing to the supplier. Let’s take an example: I am a developer and I use a laptop to accomplish the objective of writing code. So it is a dependency relationship. If you change the laptop to a tablet, then it certainly affects me as it will have an impact on productivity. In terms if code, it will be the Me class using an object of computer in DevelopCode method. This form of relationship is primarily used to model classes that implement any interface. In a way, it says that the objects of such classes realize the implemented interface(s). The relationship is depicted by joining the class and interface with a dashed line with a hollow arrow head pointing to the interface realized. A practical example in the .Net world is the implementation of the IDisposable interface which needs the public method Dispose() implemented. An association relationship signifies a stronger form of relationship between two entities. While generalization relationship signifies a “is-a” relationship, association relationship signifies a “has-a” relationship. This type of relationship comes into play when the relationship between two entities is more of containment than a superclass-subclass relationship. A car “has-a” engine (that “a” should have been “an”, but I just want to make my example clear without getting into English grammar rules). Similarly a library “has” books. A student “has-a” schedule. Association relationship is shown by a solid line between the two entities sharing the relationship. In code this strong relationship manifests in the form of a one entity using the object of the other entity as a class variable or property. In real life, entities rarely stand all by themselves. They are complex, and they are complex because of their interaction with other entities. If you notice the examples mentioned for association relationship, then you might be thinking, that there are some scenarios in which an entity can have a scope which is dependent/independent of the other entity. An engine can be taken out of a car and fixed into another car, a book can be sold by a library if it does not find any patron for a long time and a schedule has no meaning without a student. In order to take this scenario into account, association relationship can be broken down into aggregation relationship and composition relationship, depending upon the fact whether the lifetime of one entity depends upon the lifetime of the other entity, which in turn is determined by the strength of relationship between the two entities. For example: A car engine can have a life outside of a car, but a schedule cannot have any meaning without a student. Aggregate relationship is a special form of association relationship. In this relationship, the lifetime of the individual entity is independent of the aggregate entity (complex object). In code, the individual entity’s class object is used as a variable or property in aggregate entity’s class code. Aggregation relationship, in UML is denoted by a solid line between the two entities, with a hollow diamond at one end attached to the aggregate entity. Composition relationship is a special form of association relationship in which the lifetime of the individual entity depends on the lifetime of the composited entity (complex object). In code, the individual entity is defined within the composited entity. Composition relationship, in UML is denoted by a solid line between two entities, with a solid diamond at one end attached to the composited entity. 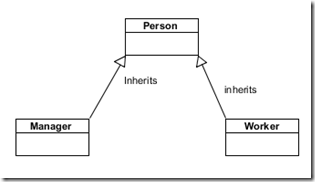 I hope this post will help clarify some of the concepts related to inheritance relationships in classes. 1. Having a theoretical understanding of advanced constructs offered by an object oriented language like C# or Java, but not a practical understanding as to where they can be used. 2. Trouble understanding the source code of well-constructed, well documented software. 3. The developer ends up creating code, that is hard to maintain. When these developers come on to more responsible positions, they are not able to effectively lead and mentor the incumbent developers under them. I believe that technical writers should also take upon the responsibility of including a short section on object oriented thinking before touching upon the technical semantics of object oriented language. Majority of the developers get their first experience of computer programming in an object oriented language while they are in school. Due to questionable quality of teacher(s) available, they end up learning to use the language in a procedural manner, thus not learning the true nature of the object oriented paradigm. Recently, I was having a discussion with a colleague about a domain model and the kinds of design patterns that we could use to structure things, and he made a thought provoking remark, about how things differ in the Java and .NET world. He made the remark that a Java developer thinks in terms of objects, because of the way Java is taught and maturity of the developers in the Java world, while in .NET arena most of the developers think in terms of screens and the resulting code that can then support those screens. Most of the .NET developers transitioned from the VB6 (a non-object oriented language) and continued software development in more or less the same way in object oriented languages supported by the .NET Framework. Microsoft worked to make the transition easier by emphasizing on VB.NET (an easier language for someone coming from VB6 background) and developing technologies like ASP.NET Web forms which were event based and could be used without a strong understanding of object oriented concepts. Please bear in mind that I am not saying that Web forms are bad, it is just that they are easily misused (I myself am a Web forms developer). 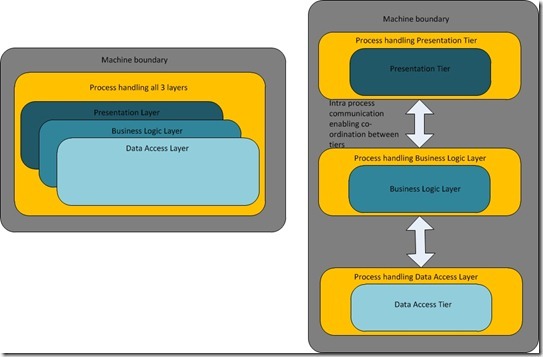 It is only recently that Microsoft has started releasing documentation centering around practices which emphasize organized object oriented development, rather than the traditional selling point of Rapid Application Development. Still I feel there is a dearth of simple examples in MSDN that educates the developers on how to develop applications in an object oriented manner. Still a lot of documentation only tangentially touches upon the foundational object oriented concepts. A lot of examples assume a very simple domain model work with the assumption of having a very direct correlation between the data and the object model, resulting in usage of Entity Framework in virtually every example. This further makes the learning from examples a bit harder than it ought to be. Anyways, I hope for the best and believe that all .NET developers (me included) will learn about the basics of object oriented paradigm in the manner intended. I myself learnt about the languages and frameworks first and later on learnt about the true nature of Object Oriented paradigm and how to use the constructs of an object oriented language (C# in my case) effectively. I list some resources below that have helped me to learn about the object oriented paradigm and how to use the language constructs effectively. In my next post I hope to touch upon a practical example of object oriented programming using Visual C# and using .NET Framework. 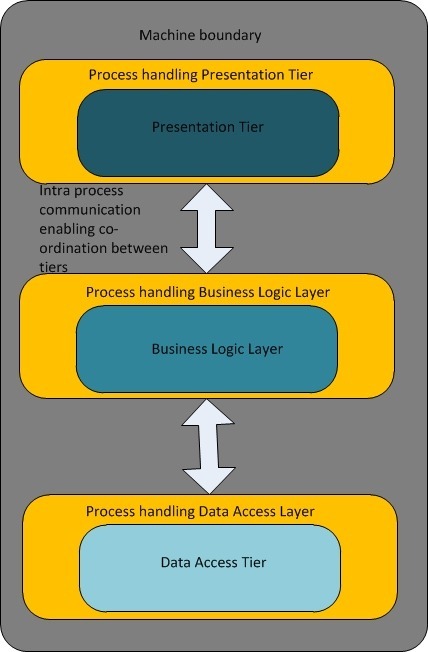 The post explains about the origins of layered architecture, how it evolved into tiered architecture and the core difference between the two. When software development started out, the software made was relatively simple and the industry was still climbing the learning curve. Even with procedural languages, layering of source code was done so as to allow a logical separation of responsibilities and concerns. This got to the next level with the introduction of object oriented languages and the entities forming the problem domain in the source code acquired a layer of their own. As the complexity of softwares developed increased aka the functionality offered by the softwares in general increased, so increased the number of layers. With consolidation of IT assets, came the next wave of computing in the form of client – server computing with softwares living life at a single place - server rather than living individually on client computers. As the number of consumers increased, measures were taken to tackle the workload and here is where the concept of layers was taken further to introduce the concept of tiers. The tiers were simply layers bound together in one physical unit, primarily made from the perspective of scaling (installing on more than one machine). The unit of layers could depend upon other such units to provide the required functionality and have some kind of communication ability depending upon the environment and usage scenario. Layers emphasize logical grouping of related functionality while tiers signify the physical separation of such logical groups. 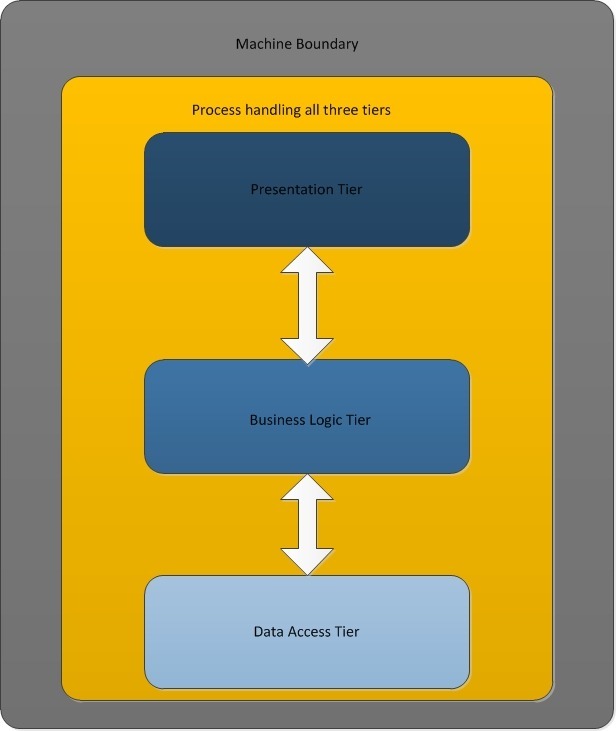 An easy way to visualize this is by imagining that all your code resides in a single project and is running on a single server in a single process, while in case of a tiered approach the tiers are located on a single machine and being handled by different processes and communicating among themselves via some mechanism to achieve the desired outcome. 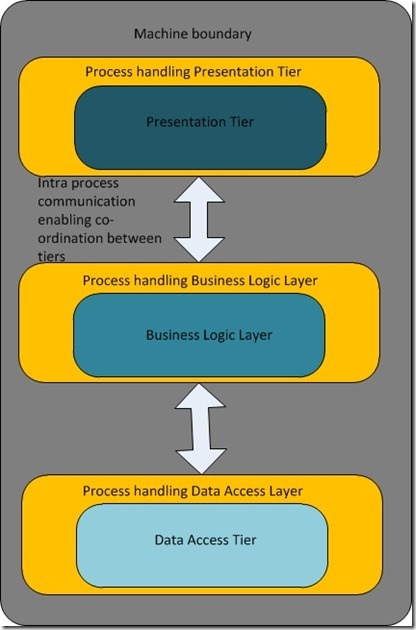 A typical software project consists of 3 layers – Presentation, Business Logic Layer (BLL) and Data Access Layer (DAL). It is when there are more than 3 layers, that your project can be termed as an N-Layer project. Similarly when your project contains more than 3 tiers, it is accepted to term it is an N-Tier project. 1. Single machine, single process: the simplest case, tiers can exist on a single machine and can be handled by a single process. 2. 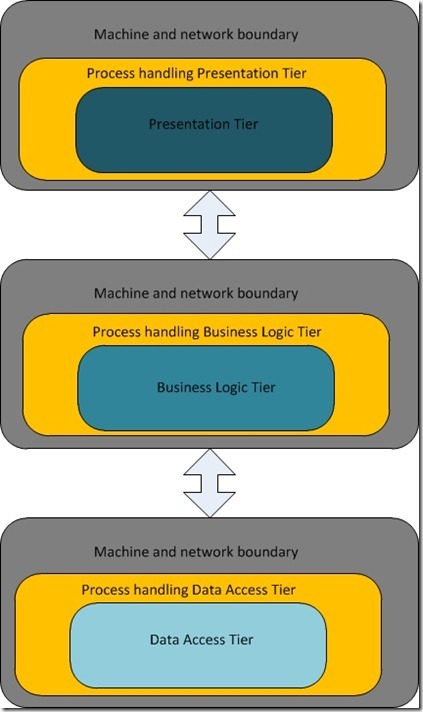 Single machine, n processes: A scenario where each tier is being handled by a dedicated process. 3. True N Tier: Where each tier is hosted on a separate machine and is being handled by a dedicated process. 1. Performance: Separating out the layers into tiers can give performance benefits as it gives us an opportunity to harness the processing power of more than one computer. 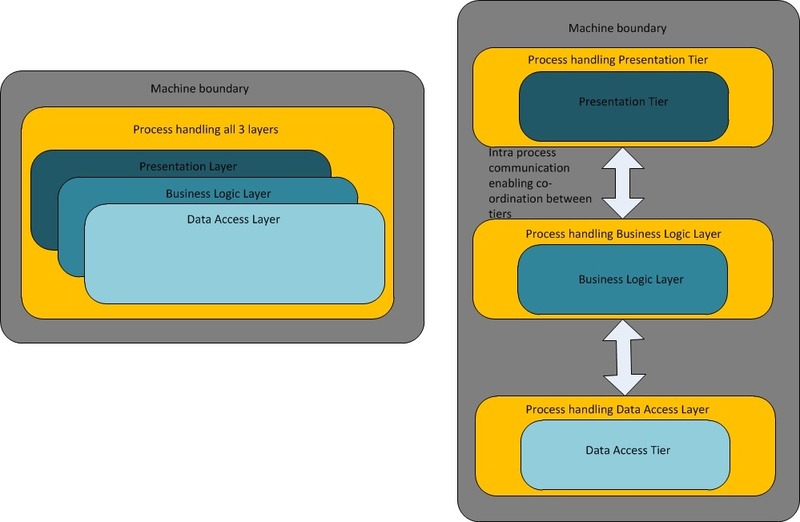 Example: One server can be made responsible to process traffic related to business logic, one to handle the data access, while if the UI load cannot be handled on one server, it can be made to be served via two servers. Thus we only increase the hardware where it is needed, giving us a flexible and performance centric solution. 2. Scalability: Scalability means the ability to handle increased workload. That in IT world means the ability of software to handle increased workload via expansion into additional hardware. Translated, it means that tiers can be moved to additional hardware according to the needs and made to handle the additional growth. a) If users of an application experience a slowdown, it might be an issue of the Data Access Tier requiring more horsepower. Thus we can expand only that tier with the help of additional hardware. b) If an application experiences peak load only during certain times of the day, then it is a prime candidate for being made in a tiered fashion. Say, in the morning time the application needs to be served by a set of two servers on a per tier basis, but by noon the load decreases to an extent that it can be handled by only one set of servers on a per tier basis. 3. Fault Tolerance: Critical applications are served by redundant servers i.e. more than one server serving the same version of an application. This is done so that in case when one of the servers goes down, the other server can take over and continue to serve the application. This can be extended to tiers, when more than one server serves the same version of a tier, thus providing fault tolerance. In most of the cases these servers are load balanced using some kind of a load balancing scheme. Now that we have learnt about the benefits of tiers, let’s learn to apply this pragmatically. Whenever we work with tiers, we have to deal with inter physical boundary communication in order to make tiers work with each other. 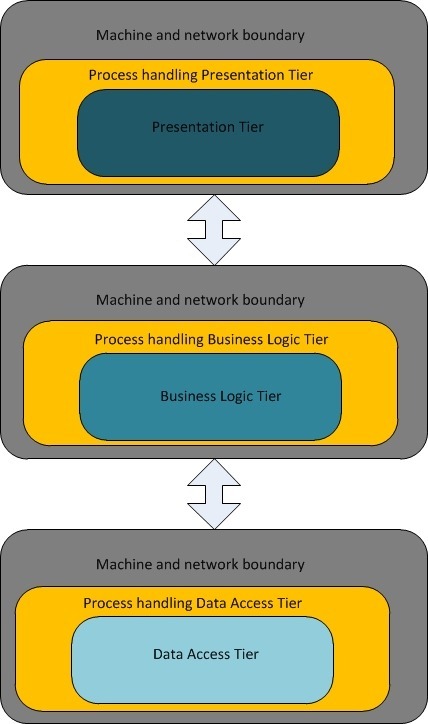 Physical boundary is defined by either a process within which the tier is running when all the tiers are available on the same machine or by a network boundary when they are available on different machines and have to communicate across network in order to work together. This inter boundary communication introduces a lot of overhead not only in terms of communication latency, but also programming complexity. Thus an application should only be tiered when it meets a certain level of requirements – load conditions, performance requirements, fault tolerance and of course budget. So all in all, play with tiers but only after doing a through cost-benefit analysis of the application and considering the life span of the application. Hello, this is my first post. I start this endeavor with only the best of intentions. Let's see how far this goes.